Seeking Curtin Law School students interested in volunteering to coach or judge in the next rounds (in May and June) of the Law Society of Western Australia high school mock trial competition. CLS students will be mentored to prepare them for their roles. Volunteers will receive a letter from the Law Society in acknowledgement of their community service. This opportunity is made available through Curtin Law School’s sponsorship of the mock trial competition. The winner will be announced at the ANU GDLP ALSA Conference Closing Gala and will win $1,000. The top 4 essays will also be published in the ALSA 40th Anniversary Academic Journal published later this year. The month-long writing period opens today, Friday 12 April, and will close on Sunday 12 May at 5pm AEST. The 2019 Boston Consulting Group Scholarships are now open for application. Please refer to the image for more information. A number of positions are currently available at the Supreme Court of Western Australia for Associate, Research Associate or Research Orderly positions. Dive In is an introductory program that provides students with some of the skills needed to apply for a clerkship, paralegal position or internship. Students will get a taste of life in commercial law at a top‑tier firm. They'll get insight into the type of work they can expect, details about our business and areas of practice, plus practical tips for preparing for work in a large law firm. Applications are welcomed from first to third year undergraduate law students or first year Juris Doctor students. Enisa Nurkovic is in her final year of law at Curtin University. She has been volunteering at CCLSWA, a not-for-profit Community Legal Service since May 2018, helping people with banking and finance and related consumer disputes. Enisa is more unique than our usual volunteers in the fact she is a law graduate from the University of Sarajevo, Bosnia and Herzegovina. She is required to complete some units of law at an Australian University in order for her to be able to practise law in Australia. She is keen to get experience to complement these units. She says: “at CCLSWA I have been exposed directly to issues from clients on the telephone advice line. This real life experience is invaluable to someone aspiring for a career as a solicitor. This is a challenging situation as the issues vary, and it involves research and problem solving.” When asked why people should apply to volunteer at CCLSWA, she said “It is a great opportunity to be able to independently advise clients on legal matters in a supervised environment. I strongly believe that this will help anyone looking to improve their legal skills in any given area of law. CCLSWA provides a friendly environment with highly motivated people who are always willing to help. It is a rewarding experience knowing that your contribution has made a difference to the community, and that your legal advice might have helped someone who would otherwise not have been able to get the advice.” Finally she says “Be confident in your abilities and don't be afraid to apply for positions which might require application of a field of law that you might not have prior experience with”. yegal.com.au is looking for 6 Perth based paralegals right now. The client is a global law firm is seeking 5 x Paralegals to assist on a cross-border dispute. This is a leading international law firm with offices in 5 continents. The firm acts for a number of blue-chip corporations both locally and overseas. You will be working as part of a team of lawyers, paralegals and other support staff on an e-discovery project. Candidates with prior legal experience will be viewed favourably. Design Your University Experience with Stanford University & Curtin University! You must register to be eligible for this amazing experience. Open to all Curtin University Undergraduates who have completed 200 credits or less (early degree). This 2-day intensive has been created through the newly established partnership between Curtin University and Stanford University, which continues to grow. The Life Design Intensive employs a design thinking approach to help students from any major develop a constructive and effective approach to finding and designing their vocation after Curtin. This 2-day intensive offers a framework, tools, and most importantly a place and a community of peers and mentors where we’ll work on these issues through assigned pre-work, reflections, and in-class exercises. Mid 2018 a team of Curtin University staff from the Faculty of Business and Law and Curtin Careers and Leadership travelled to Stanford University, California, to undertake the Stanford Life Design Studio for University Educators intensive course. Curtin was the first Australian University to be accepted and trained by Stanford, in their world-famous Life Design Lab Courses, which focus on a combination of Design Thinking and Positive Psychology Principles. Our partnership between Curtin and Stanford continues to grow and we will be rolling out this program for our students. If you have any questions contact the Faculty of Business and Law, Student Engagement Team via email experiencecbs@curtin.edu.au, phone 9266 4572 or pop into Building 407 Room 210. CD Lawyers have a law clerking opportunity. They are based in Clarkson and practice primarily in family law, estates matters (contested and non-contested), criminal law and general litigation. They are looking for someone to do a 10 or 15 day clerkship that can be done in a block or over as many weeks as required. Upon satisfactory completion of the 10 or 15 day program you will receive a letter of reference and the partners may act as referees. They have had several students do similar clerkship's and they have either been assisted by our references in obtaining other clerkships or now work with our firm. This period may be counted towards your required practical legal training days. To apply please email your CV and cover letter to info@cdlawyers.com.au. The Big Meet is the ultimate careers fair for undergraduates, graduates and postgraduates from all disciplines. Whether you're looking for graduate employment, a new job, vacation work, an international internship, a gap-year experience, voluntary work, travel, overseas opportunities, a teaching job or postgraduate education, The Big Meet can get you started. Visit www.thebigmeet.com.au for further information and to register. Entry is FREE. Don't miss out! The Hon. Aaron Stonehouse MLC is currently accepting applications for the John Stuart Mill Internship Program. The program involves working with the office of The Hon. Aaron Stonehouse MLC as he fulfils his parliamentary duties. The internship is unpaid though a recommendation letter will be provided at the conclusion of the program, expected commitment is also flexible. 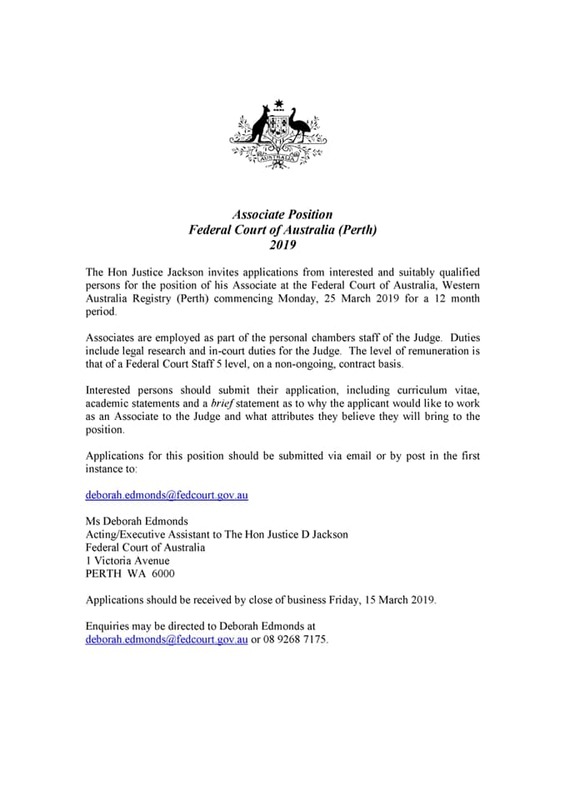 An associate position at the Federal Court of Australia, Western Australia Registry (Perth) is available for interested and suitably qualified persons commencing Monday, 25 March 2019 for a 12-month period. Join The College of Law Australia and the Legal Practice Board Western Australia on Wednesday 20 March to learn the why, where, when and how of applying for admission to the Western Australian legal profession. Register your free place today - it will only take 30 seconds! Are you committed to social justice and community service? The Employment Law Centre of WA (Inc) (ELC) is a not for profit community legal centre which provides employment law advice to vulnerable Western Australian workers. ELC are recruiting volunteers with a commitment to social justice and community service. assisting ELC solicitors, staff and volunteers as required. Applications due 5pm, Friday 8th March 2019. If you do not address the above selection criteria, your application will not be considered. LawCPD is a pioneering company that offers mobile-friendly online continuing professional development (CPD) training for lawyers. LawCPD is currently seeking a casual customer support officer to join the team for up to 2-3 days a week. This opportunity is for an immediate start for a 6-week contract, with the possibility to extend for a further 6-12 months for suitable candidates. The Western Australian Branch of AMPLA Limited is offering a prize of $1000 and a copy of the most recent AMPLA Yearbook for an essay that deals with an aspect of Resources or Energy Law. The CSLS has a current opening for the position of Careers Officer. You must be an existing CSLS member to apply. 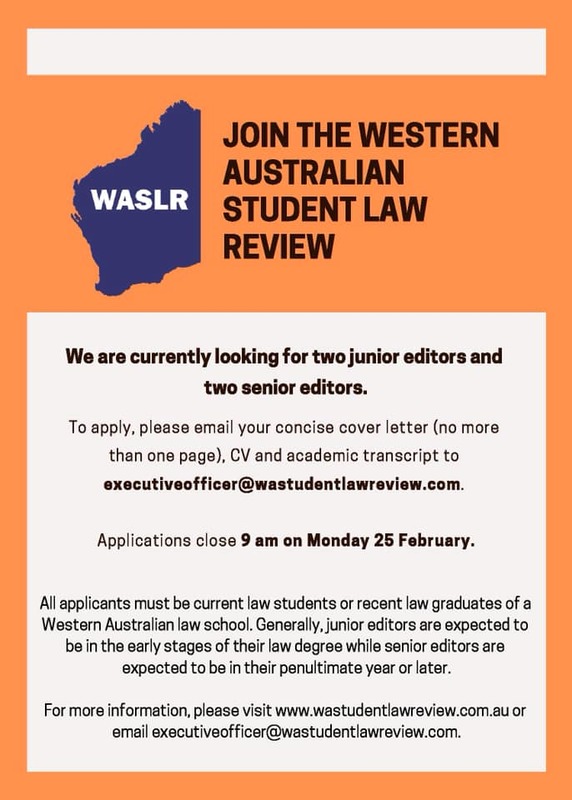 The Western Australian Student Law Review is currently looking for two junior editors and two senior editors. Please refer to the image for information on how to apply. if you would like to know more about the College PLT program please contact WA College Lecturers Michelle Harries (9214 0214) or Pia Castelli (9214 2209) and they would be pleased to answer any questions that you may have. Click the link below to enrol today! The Supreme Court is now accepting applications for two positions: Associate and Research Orderly to the Honourable Acting Justice Strk. Both positions are offered until 30 June 2019. 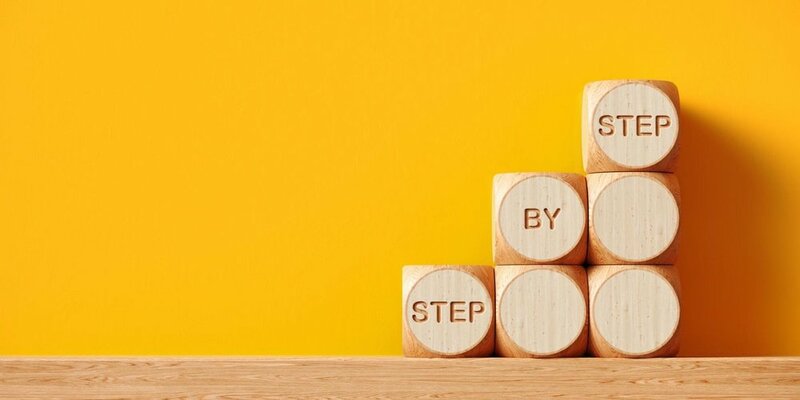 Take the next step in your law career by applying now for a place in Curtin’s new Practical Legal Training (PLT) program, launching on 25 February 2019. 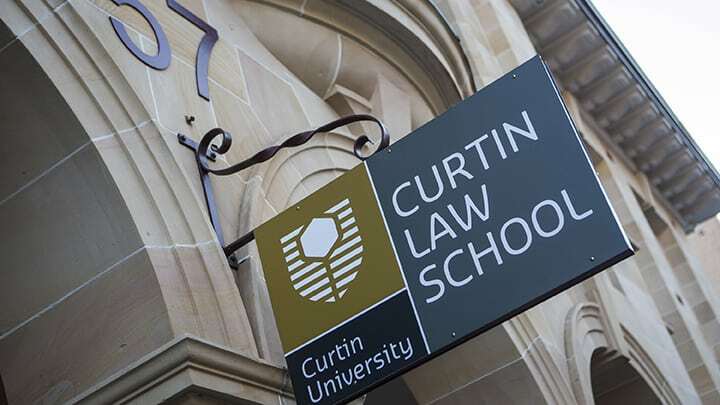 Curtin’s PLT program is approved by the Legal Practice Board of Western Australia and is the first to be delivered by a Western Australian university. You’ll receive a quality, practical legal education, delivered right in the heart of the Perth CBD and legal precinct. Benefit with access to our state-of-the-art facilities, quality online materials and be supported by weekly, face-to-face contact with legal practitioners. We also offer the convenience of evening classes in the city location, so you can continue to work and study at the same time. You will also have the option to guarantee legal workplace experience through the John Curtin Law Clinic. You will work directly with clients, providing advice on real commercial matters. Learn to manage files using practice management software and be mentored and supervised by experienced legal practitioners. 6:45pm - 7:30pm light refreshments and networking. An exciting new club will be starting here at Curtin University next year! The Curtin Legal Advocacy Club (CLA Club) is a student-run organisation, providing law students the opportunity to develop their oral advocacy skills. The CLA Club will aim to offer workshops, seminars, and training sessions, run by professionals and academics from across Western Australia. We are looking to gauge student interest to plan for the year ahead. To register your interest, please complete this 2-minute sign-up form! A Practical Legal Training opportunity is available now with Leo Cussen who is still accepting applications for their PLT course starting in February 2019. Secure your place by enrolling online. You don’t need to wait for your final semester university results, simply provide Leo with your most recent unofficial academic transcript. Leo provides you with 13 days of face to face training at the start, middle and end of your course to provide you with a more personalised training and mentoring experience. A research orderly opportunity is available to law graduates and young lawyers for the position of Research Orderly to the Hon. Justices Murphy and Mazza of the Court of Appeal of Western Australia. Applications should include a covering letter, curriculum vitae and a current academic transcript (or a certified copy). Applications close 4pm, 12 December 2018. Late applications will not be considered. See the images for more information! Applications for the Legal Clinic unit (Trimester 1 2019) close on November 26. Undergraduate clinic opportunities may not be offered in Trimester 2 so those interested are encouraged to apply now! 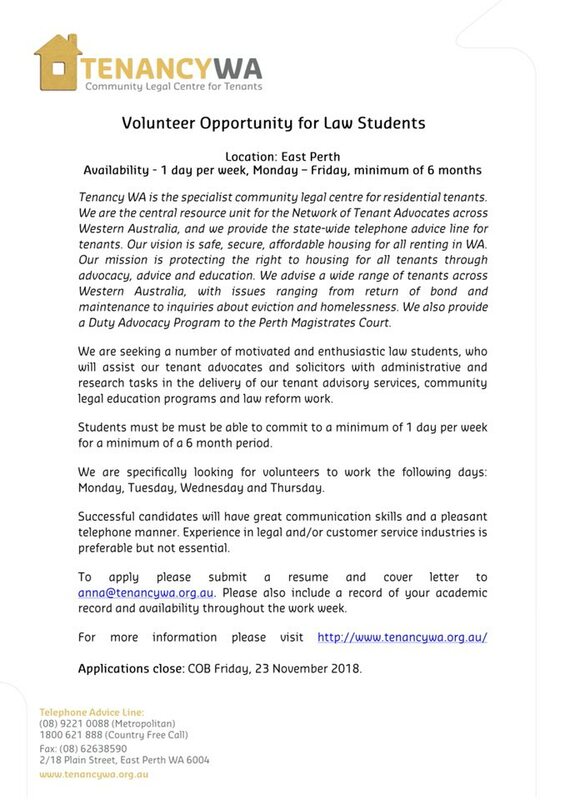 TenancyWA are seeking a number of motivated and enthusiastic law student volunteers to assist tennant advocates and solicitors with administrative and research tasks in the delivery of their tenancy advisory services. See the image for more information! The Faculty of Business and Law is offering a Summer Research Scholarship to a Faculty of Business & Law student graduating at the end of 2018 who intends to enrol in the 2019 Bachelor of Commerce (Honours) or the Bachelor of Laws (Honours) program. 1. The student must intend to enrol in the Bachelor of Laws (Honours) program for 2019. 2. The application must be submitted by a potential Honours supervisor (ie an academic staff member). Students cannot submit an application. 3. The deadline for the submission of applications is 5pm on Monday 12 November 2018. 4. Students interested in applying for the scholarship should send an email to the Honours Coordinators at law.honours@curtin.edu.au. The Honours will check the eligibility of the student for admission to Honours and, if the student is eligible, will communicate the student’s interest in applying for the scholarship to academic staff in CLS. Any queries can be directed to the Honours Coordinators at law.honours@curtin.edu.au.